Define the term object reference. As typified by simple classes that are self-referential. There are two things in this assessment statement. "object reference", which should be a review, and "self-referential classes", the new, powerful usage of object references. First there's the same old same old very important concept of an object actually being, at its core a memory address reference. makes a "reference" variable, which is actually/technically the address of where the Student object resides. What is s technically/literally? s is a memory address, which points to the data associated with it. 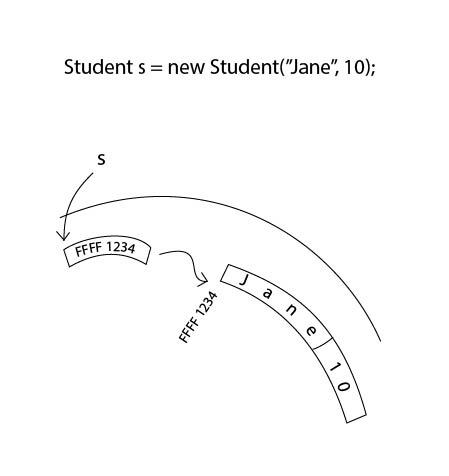 So yes, via dot notation (.getName( ) and .getGrade( )) we can access the data associated with s. And, yes, some place in memory, there is a String with the value of "Jane", and right beside it is an int, with the value of 10. But it's the address of where those two things reside which s actually is, so let's say FFFF1234. So what is s, technically/literally? FFFF1234. And what does s therefore represent; what useful information does it point to, that, using dot notation we can get at? The data residing at memory address FFFF1234, which is "Jane" and 10. So that's it for the review of what objects are, now onto the new concept which makes use of object references, self-referential classes. This is the kind of class in which at least one of its attributes is another instance of that class. 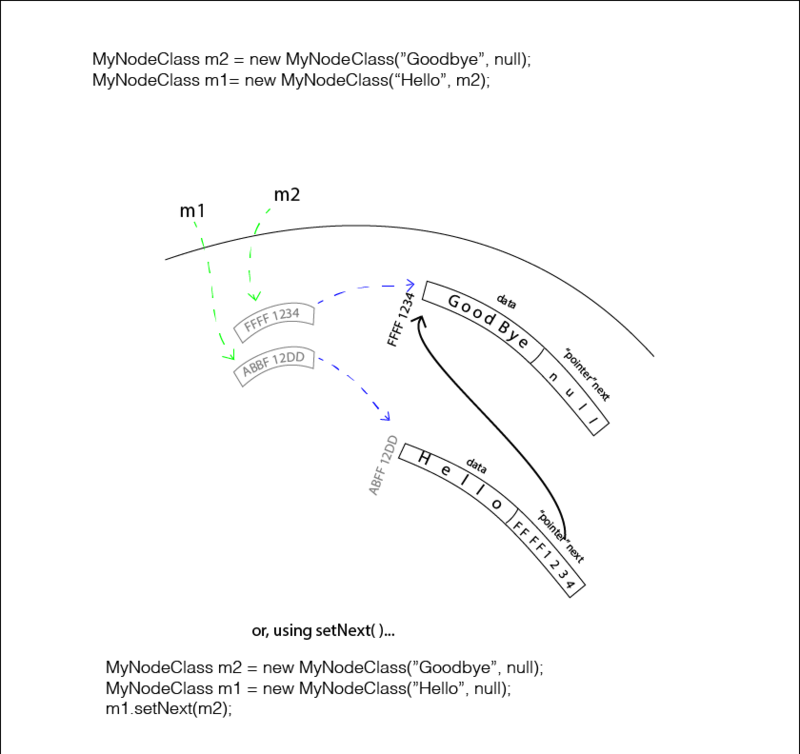 Above, we can classify the class as being a self-referential class, because one of its attributes is of the type that it is; specifically, the MyClass class has attribute of type MyClass. So why would we want self-referential classes? With the use of self-referential classes, these kind of objects can easily find and link to other objects of the same type, and thus form lists of those objects. This is what is done with the abstract data type (ADT) LinkedList, and others similar to it, like binary search trees. Lists are data structures in which instances of a certain type can link up to form an abstract data structure. This structure need not be made of instances which are physically side by side in memory, as is the case with arrays. Rather, through knowing where each next "link in the chain" is, in terms of memory, the full list can be navigated back and forth. 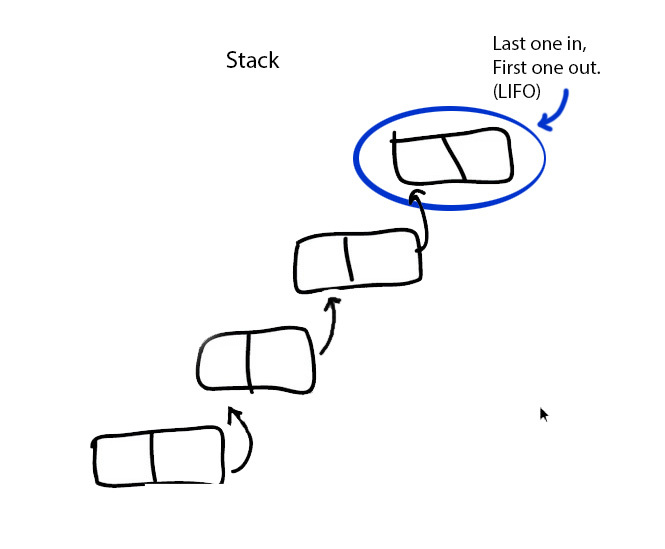 The advantage of a list over an array is that the instances of the list can be scattered throughout memory; lists do not require one big contiguous memory space, as arrays do. 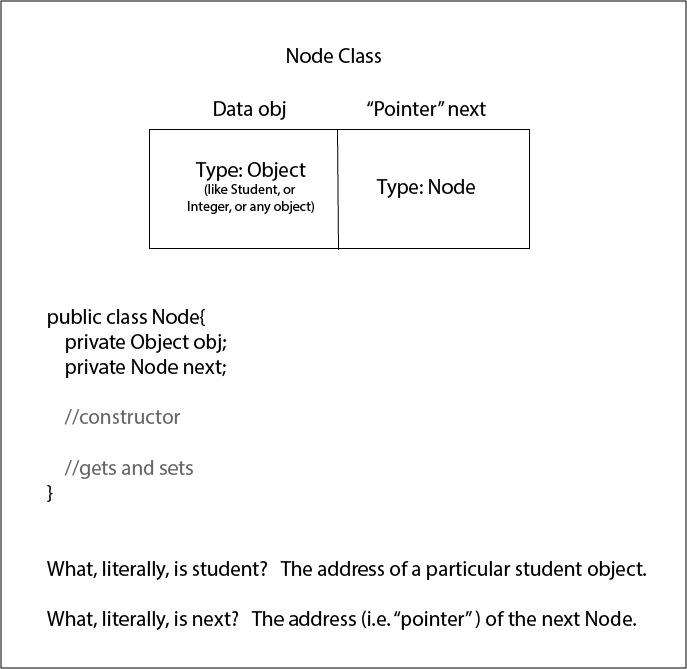 So in a linked list, a Node instance does not just reference useful information like student name and grade. Self-referential nodes also contain "references" to another Node instance. And it is with this reference to another instance of the same class type that it forms a link with it, and thus, step-by-step, link-by-link, forms a list. See the next assessment statement for details of how this looks in practice.